This Tang Soo Do Combination Training DVD series is a must for all serious Tang Soo Do students. The nine combinations consist of all of the basic techniques that are generally taught as part of any Tang Soo Do curriculum. They are easy to learn and provide practitioners at all levels with the opportunity to perfect, refine and maintain their Tang Soo Do skills utilizing only a fraction of the training and practice time that is normally required. Practicing these combinations also does not require a large workout area and results in enhanced physical conditioning and endurance. Lack of adequate time and workout space are two of the primary reasons identified by students when they are unable to practice. Once they are learned, they provide the Tang Soo Do student with a comprehensive daily workout that can take as little as 5 minutes and no more than 30 minutes. In addition to the benefits already described, you will also have the opportunity to apply and practice the techniques from each of the combinations in one- step sparring (self-defense) and semi-sparring format without having to learn any additional techniques or material. Grandmaster Ah Po is a firm believer in simplicity and also in ensuring that Tang Soo Do technique execution is practical and efficient. 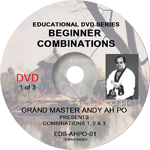 Therefore, the one-step sparring and semi-sparring applications demonstrated on the DVDs were developed by Grandmaster Ah Po with this Moo Do philosophy in mind. At this time, DVDs are sold as a complete set only.